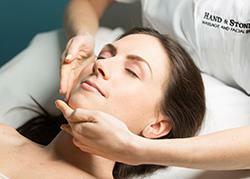 The estheticians at Hand & Stone perform professional facials at reasonable prices. Whether you have a specific peel you'd like performed or wish to experience one of our anti-aging collagen facials, we have plenty of options to meet your needs. We're located in Jacksonville, FL. Our facial treatments clean and exfoliate the skin, potentially allowing our guests to achieve the soft, even complexion of their dreams. Whether you'd like a peppermint scalp massage or hand therapy to go along with your facial, we offer a number of supplementary services to make your time with us as unique and luxurious as possible. Our signature facials include treatments designed specifically for men and teenagers. We're open seven days a week, so we're readily available to help you look and feel your best affordably. Call Hand & Stone today to make an appointment. Our local spa in Jacksonville also welcomes walk-in clients if you'd rather just drop by. To take advantage of our refreshing facials regularly, you can join one of our membership programs.